Celtic cross Christmas ornament features velvet cloth construction that is enhanced with beads and sequins. This Irish Christmas ornament features an intricately decorated velvet Celtic cross with gold thread knot-work interlacing. The Celtic cross ornament is enhanced with bright shining beads and along with glittering sequins. 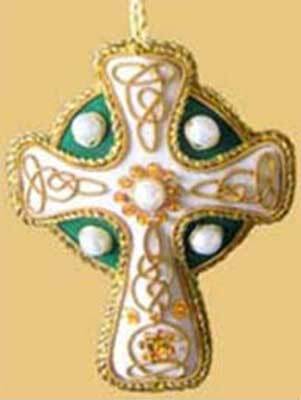 The Celtic cross Christmas ornament is fully decorated on both sides; the dimensional design measures 4" wide x 3 1/2" tall. The Irish ornament is made in Ireland by Islandcraft and it is gift boxed with Celtic cross and Celtic knot history cards, complements of The Irish Gift House. Irish High Crosses can reach heights of four meters and the classic ring at the top is said to be a symbol of eternity. Celtic crosses were usually carved of sandstone or granite and indicate a holy place. Shamrock Christmas ornament features velvet cloth construction that is enhanced with beads and sequins. Claddagh Christmas ornament features velvet cloth construction that is enhanced with beads and sequins.